Th-INK-ing of You: A masculine Birthday... clean and simple! Hello sweet friends! I hope you are all doing well! I'm glad to say that for now we have cool air again! There is still something wrong because we are leaking freon, so our serviceman needs to come back when he has time to dig in to the inside system and possibly trace the lines, but I'm sooooo thankful to have cool air again!!! Today I have a masculine card to share with you that was inspired by the following wedding cake, which came from a site called the Perfect Palette. It's a site that helps brides in the planning of their wedding and pulls together all kinds of great color combos and themes.... some of which I would NEVER have thought of! So... needing a masculine card... I decided on this totally cool cake for my inspiration! 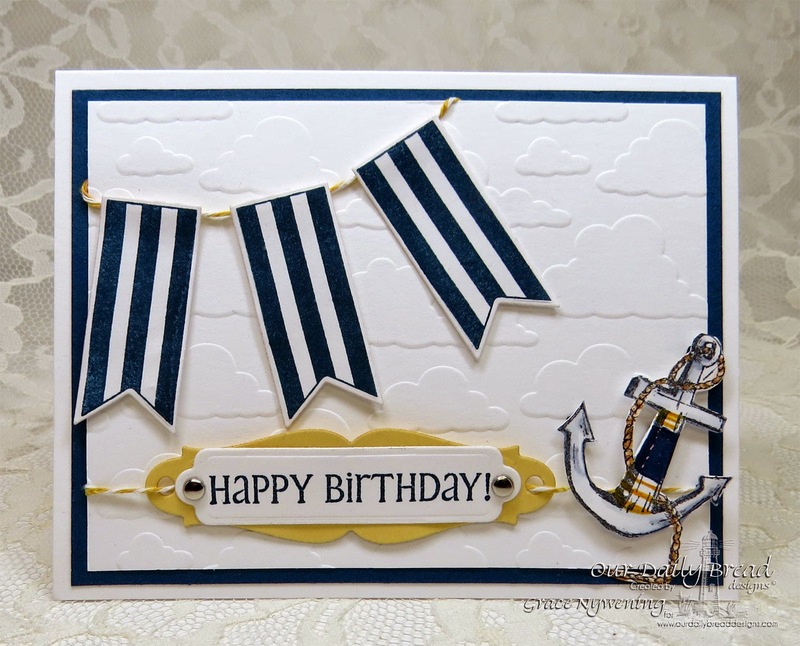 So I used this month's release from ODBD, Patriotic Pennants, and past releases Little Boys (sentiment) and Anchor. I cut the anchor out from the background that the stamp has, and tried to color it up like the one on the cake, using SU! markers. I stamped the striped pennants with Midnight Muse ink and cut out with the ODBD Custom Pennants Dies. The sentiment is cut with two different Spellbinders Grommet Tag Dies. I used a clouds embossing folder (Embossaliscious) for my white layer, added some twine to hang my pennants from and to hold my sentiment, and that was it. For the one who asked for a simple card.... I think this fills the bill! "For me to live is Christ and to die is gain. But if I am to live on in the flesh, this will mean fruitful labor for me; and I do not know which to choose. But I am hard pressed from both directions, having the desire to depart and be with Christ, for that is very much better; yet to remain on in the flesh is more necessary for your sake." What a beautiful picture of a life lived for Christ and His glory.... but also filled with assurance that when we are believers, when this body has passed away... our spirits are with Christ in Glory! On the cross, Jesus said to the thief who acknowledged Him as Christ... "this day you will be with me in paradise." It brings to mind too, a favorite saying of mine which we used in our wedding: "Only one life... 'twill soon be past, only what's done for Christ will last". We can't earn our salvation... that's why our Savior had to die to pay the price He did not owe, but we could not pay... but our purpose while here on this earth is to be busy doing whatever it is He has called us to do... to bring Him glory! I know our friend Larry is in heaven now, casting his crowns at Jesus' feet and resting in that place that is "far better". We have that hope ... assurance in us, but in the mean time, it is our job to be busy doing what brings Him glory. May it be so in my life! So sorry about your friend, Grace. Beautiful message and card! What a wonderful card Grace - I noticed the gold on the anchor and it is a fabulous detail. What a comfort to know Larry is with Jesus, and may you know Christ's comfort as you mourn your loss. Very pretty masculine card Grace. 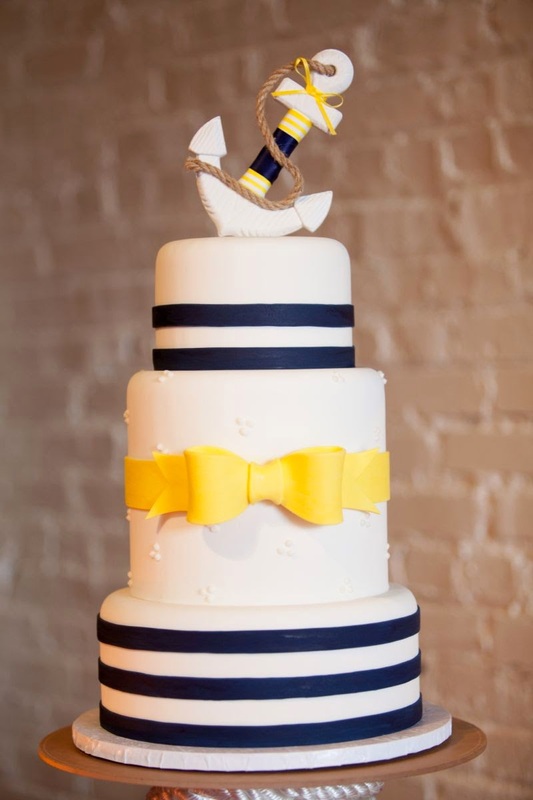 Love how you put those elements together to coordinate with the cake. Hope every thing is well now. This is gorgeous Grace! Love those banners and the embossed clouds. A totally masculine card Grace. Being an old sea salt It appealed to me instantly.